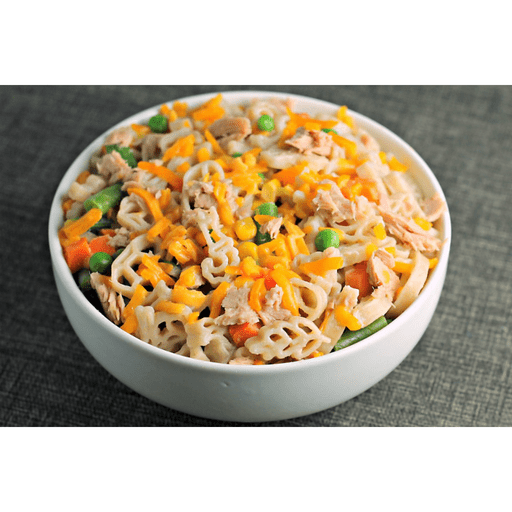 Made with wholesome ingredients like fiber-rich whole grain pasta, heart-healthy tuna and protein-packed Greek yogurt, this Cheesy Tuna Mac packs a mean nutritional punch without sacrificing flavor. And for an extra special twist, this dish can easily be made with fun-shaped pasta that your whole family will love! 1. Cook pasta according to package instructions. 1. Microwave vegetables for 2-3 minutes until hot. 1. In a small bowl, mix together yogurt, milk and onion powder until well blended. 1. Drain pasta and place in a medium bowl. Add vegetables and yogurt mixture 1. toss to combine. Stir in cheese and tuna until well distributed. Season with salt and pepper, to taste, and serve warm. For gluten free: Use gluten free pasta instead of whole wheat. Per Serving: Calories 380, Total Fat 11g (Saturated 6g, Trans 0g), Cholesterol 50mg, Sodium 370mg, Total Carbohydrate 45g (Dietary Fiber 5g, Sugars 4g), Protein 27g, Vitamin A 15%, Vitamin C 2%, Calcium 25%, Iron 10% *Nutritional values are an approximation. Actual nutritional values may vary due to preparation techniques, variations related to suppliers, regional and seasonal differences, or rounding.